So, if I had to throw one outfit together out of my whole closet, it would totally be this one. All of these pieces are my favorite go-tos for different reasons, but also pair so well together. My signature color, blush pink, paired with this Everlane white blouse were the perfect combination for staying warm + comfortable for a party we attended this weekend. I questioned whether or not to wear my Valentinos, simply because I didn't want to look too overdressed, but once I put them on, there was no turning back. I love the way rockstuds (any color) look with distressed jeans. There's just something so 'boyfriend chic' about the look that I absolutely love. And lastly, I have to mention my new favorite Brandy Pham jewels. Can we say obsessed?! I recently did a major overhaul of my jewelry and made room for my new favorites. I love the classic gold, super chic design of this needle bracelet + cage ring and can't wait to add more pieces to my collection. I'm really trying to focus on buying less and investing more these days! P.S. - J.Crew is having a 25% off ANYTHING sale today + free shipping with code SHOPNOW. It's the perfect time to stock up on fall/winter necessities, Christmas presents + stocking stuffers! I love this blush color and think I need to start incorporating more of it into my closet! beautiful!! love blush in the winter!! That cardigan pairs perfectly with those heels! I love it! Love that cardigan! It is such a gorgeous color on you. That everlane blouse is perfect! Love the way you paired it! This is the perfect go to outfit- I love your blush sweater! Just so perfect! I love this look so much, the shoes are gorgeous!! Blush pink is always a favorite. I can't get enough! You look fabulous in blush! I see why this is your go to outfit! 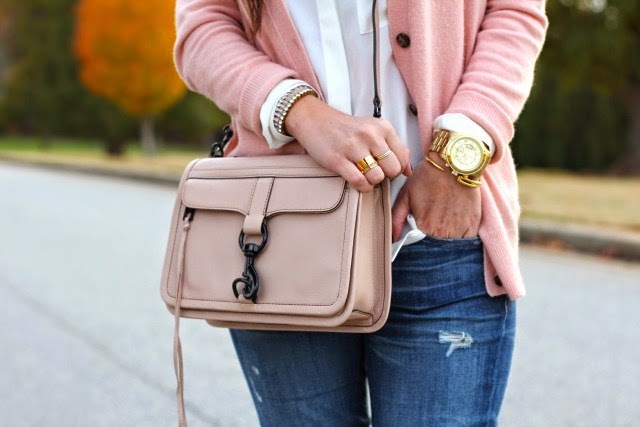 I love that blush cardigan! With my fair skin, blush tones aren't really my color but it looks great on you! I also need those shoes, I need to bite the bullet and buy them! This sweater looks so cozy and I have the same watch - so fuzzy! Absolutely adore this look! Its just so soft and girly! And those shoes!!!! To die for! !